This document describes the process of creating new forms in oracle applications. In this tutorial we will discuss about Creation of new Block. 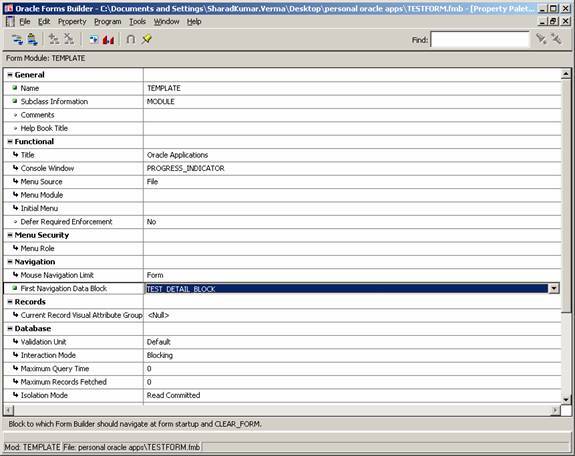 Download the template.fmb from your oracle applications server. Open template.fmb through forms builder. You will see following screen..
Click on Data Blocks and select + icon on the left toolbar. You will get following pop up window. Click on OK button and you will see following screen. Give the table name on which you want to base your block. Columns of that table will appear in Available Columns Section. Click on >> button to move the columns from Available columns section to Database items. Choose the first option to create the form layout through database block wizard. Click Finish, you will see following screen. Choose a new canvas or any of the existing content canvas. Click Next, you will see following screen. Move the items which you want to display on the canvas to the list of displayed items. Click Next, you will see following screen. You can change the width and height of the displayed items through above window. Click Finish button and you will see following screen. Enter the name of the frame and number of records you want to show in the block. Click Finish and the database block are complete with the layout. Open the layout editor to check the canvas and items. Save the form. Transfer the fmb file to $AU_TOP/forms/US on oracle applications unix server. Compile the form using following command. Transfer the fmx to the /forms/US. Add the form to the menu using a function and open the form using oracle applications.